Afghanistan President Hamid Karzai wants the elusive Taliban chief Mullah Omar to run for President in next year's election so that people could "vote for or against him". Karzai, in an interview to German daily Sueddeutsche Zeitung published on Tuesday, said his government had sporadic contacts with the Taliban but that there is no negotiation. 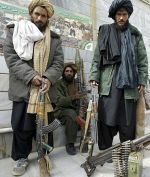 He called on the Taliban to lay down their arms and participate in the political process, the daily said. Asked whether Mullah Omar should could be a 2014 Presidential candidate, Karzai was quoted as saying: "He can become a candidate for the presidency and give Afghans the opportunity to vote for or against him." Karzai's remarks came in the backdrop of his visit to Qatar on Sunday. Karzai's government has agreed that the Taliban can open an office in Qatar if the group breaks all ties with Al Qaida and renounces terrorism. Talking about Karzai's Qatar trip, the daily quoting sources in his delegation said "there had been no discussions" on the issue of Taliban office. Karzai also complained that his government had been disrespected by the West. "We want this relationship to work better, we want to be treated as allies, not as an object," he said.